Do you ever come across a product so unbelievably beautiful, you just can't bring yourself to use it? 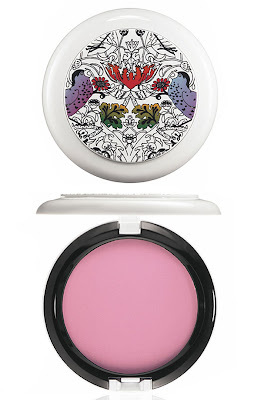 The moment I came across M.A.C Liberty of London Shell Pearl Beauty Powder, that's exactly how I felt. I am utterly enamored of the white plastic compact. Across the top, brightly hued flowers and colorful birds sit amongst a scratched black swirly garden. This is honestly one of the most unique compacts I've ever come across. And to make matters even better? The powder inside is GORGEOUS. The peachy pink hue shimmers, shines, glimmers and gleams with the best of them. Not that I'd know, because I can't bring myself to sweep a brush across its expanse just yet. Beautiful color! I love my Liberty of London and To The Beach packaging, so pretty!